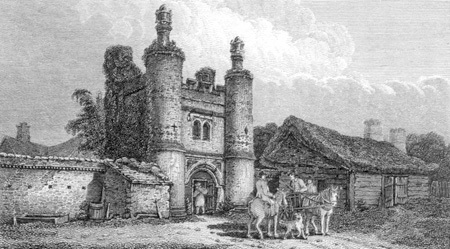 Tolleshunt Major, or Mauger as it was known at the time, was granted by King Henry VIII to Stephen Beckenham, gentleman, in 1544. As well as buying up most of the property round about, Stephen built a semi-fortified residence with a turreted gatehouse within a red-brick boundary wall some 130 feet square. The original Beckingham house has gone and replaced by a farmhouse, but the gatehouse with its turrets and boundary wall remain and can be seen from the road. The Beckinghams also added a north chapel to the parish church of St Nicholas, and set up kneeling effigies of Stephen Beckingham and his wife, Alvis Terrel, with their heraldic shield. That was completed in 1609, but has since been pulled down and the entrance blocked. The Beckingham family came from Wiltshire, Stephen’s son Thomas was knighted and died 1633 and his grandson William, aged 12 was heir. The estate was sold to Sir Thomas Adams, alderman of London. His second son, Sir William Adams, Bart., sold it in 1674 to Mr. Thomas Fox, cheesemonger of London. His wife married again and sold the manor to Dr Daniel Williams, who by a will, settled it in trust in 1711 to provide £60 per year for the Society for New England for two persons to preach in the English Plantations in the West Indies with the remainder to be paid yearly to the College of Cambridge in New England.